Andy Roberts has been a true Renaissance man of the British music scene since the 1960s. He has played with an impressive range of artists as well as forging his own career as a musician, singer, songwriter and composer. Andy made several LPs for the B&C label, including one as part of an outfit called Everyone, and had one compilation LP released on Charisma. I had the pleasure of meet Andy on several occasions in the early 90s when I went on a tour to the annual Fairport Convention festival and other musical events several times. 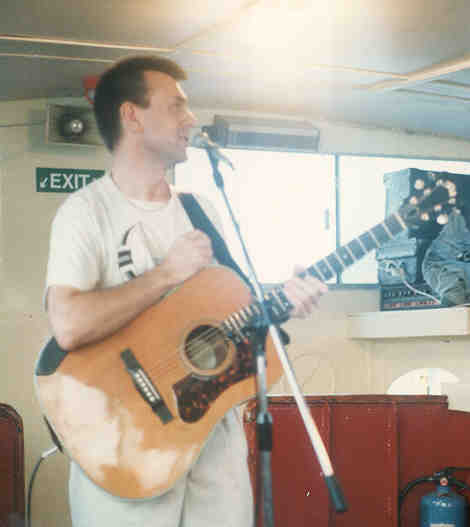 The above photo is from a private concert on a boat on the Thames in London when Andy was playing with Iain Matthews. Visit Andy’s official website – it’s excellent and loaded with interesting stuff.